One of the reasons I’m running for Congress is to stop the pattern of divisive, partisan politics that too many Washington politicians follow. Criticism of political parties and their ideas is a fundamental right and tradition of democracy. Congress cannot call itself a legislature of the people if it seeks to incriminate popular dissent. Yet that is exactly what Rep. Israel and his colleagues are trying to do. Couching Republicans as “racist” and all Latinos and other minorities as Democratic pushovers is derogatory and cheap. I know first-hand that Latinos , regardless of party affiliation, do not want their intelligence and integrity insulted. They are tired of being used as pawns by race-baiting politicians looking for election-day votes. Democratic union leaders were once the primary opponents of undocumented migrants, seeing them as a threat to labor. Would Rep. Israel have tolerated the accusation that those union leaders were racists? Rep. Israel was once a member of the J Street Gala hosting committee. Would he have tolerated the accusation that all congressmen affiliated with J Street are anti-Semitic? My guess is he would be offended by any claim that having a different opinion makes one a simple bigot. I am saddened to see Steve Israel use Latinos and other minorities as tools for his political ambitions. I am running for Congress to treat Latinos, Blacks, Asians, Jews and all other minorities as equal constituents, not as tokens on election day. 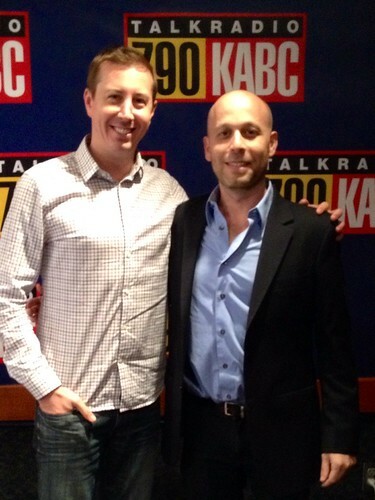 After a long on-air interview with John Phillips of KABC radio. Republicans anticipate a big election in November: the GOP is expected to hold its majority in the House of Representatives and possibly win control of the US Senate. Then, a divided party, struggling with critical demographic liabilities, will prepare to choose a nominee — and a direction — that can win the presidency for Republicans once more. It’s not clear that the GOP will change in time to win in 2016, but the change required is all too clear: unless the party appeals to more minority voters, female voters and young voters, it won’t attract enough voters to take the White House. That’s why candidates like Pablo Kleinman — a young, Jewish and Latino Republican entrepreneur running against Democratic Rep. Brad Sherman in Los Angeles — are so important. From Washington Post: Is there a pulse in the California GOP? The California Republican Party is in a sorry state. A Democrat who has served in Congress since 1997 in a D+20 district is running for reelection. A slam dunk? Maybe not. If anyone can press Rep. Brad Sherman(D-Calif.) to the limit it may be Pablo Kleinman, an Argentinian Jewish immigrant who came to the United States at aged 13 and is now a high-tech entrepreneur and frequent presence on Univision. Sitting in a coffee shop near Dupont Circle, he rattles off the statistics for his district — 40 percent foreign born, 30 percent Hispanic. Asked to describe his political leanings he says, “I’m socially moderate and fiscally conservative.” He is soft-spoken and direct; with a close clipped beard and dark suit, he looks and sounds more like an international businessman than a Republican politician. And that may be the key to his success. February 2, 2014, 9:00 p.m.
A self-described "new generation Republican" is joining the race to try to unseat Rep. Brad Sherman (D-Sherman Oaks), who won a costly battle with a fellow Democrat in 2012. Entrepreneur Pablo Kleinman, 42, is set to kick off his campaign Monday on local radio shows. Less than two years after Rep. Brad Sherman defeated a fellow Democratic in a bitter, $10 million House race, the lingering rancor is promising to give a major lift to the candidacy of Los Angeles-area entrepreneur and Republican immigrant Pablo Kleinman. Given California's unique election system, the state's 30th Congressional District, which covers northwest Los Angeles County and most of the San Fernando Valley, could reject arch-liberal Sherman in favor of the moderate conservative Kleinman, 42.